A very warm welcome to Old Church House, the newest bed and breakfast in the heart of old Newport – at the centre of the Island. Zoom in or out of the map on the right using the + and - buttons. 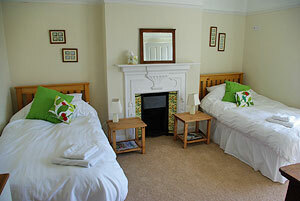 Bed & Breakfast from £30 per person, per night (depending on season) based on 2 sharing. We are a family run B&B with three rooms available throughout the year comprising a large double/family room with shower and bath ensuite and a large twin with double shower ensuite. 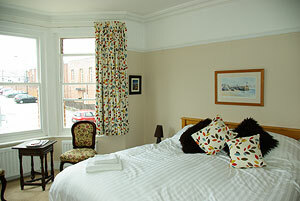 All rooms are en-suite, two rooms have a sunny Southerly aspect. We are only one block away from the High Street in a surprisingly quiet corner of the town centre. Ample private guest parking to the rear of house. The rooms are simply furnished with (we hope) everything you need. 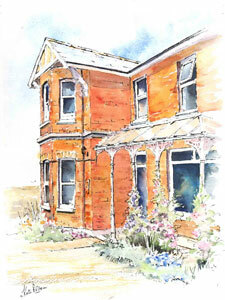 Breakfast is either Full English or Continental and is served in the South facing dining room. 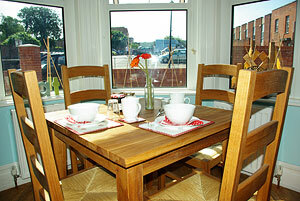 The Dining room and Bedrooms are equipped with TV/DVD and there is a good supply of Books and board games. Should you wish to be ‘green’ and leave your car on the mainland, we can pick you up from Cowes, Ryde, Wootton or Yarmouth terminals at cost price. Newport is the capital and County town of the Isle of Wight situated in the middle of the Island at the focal point of the local road and bus network. All parts of the Island are within 20 minutes drive or accessible by bus from the central bus station which is a 5 minute walk from us. Whether you’re here on business or pleasure we look forward to making your stay a happy one.